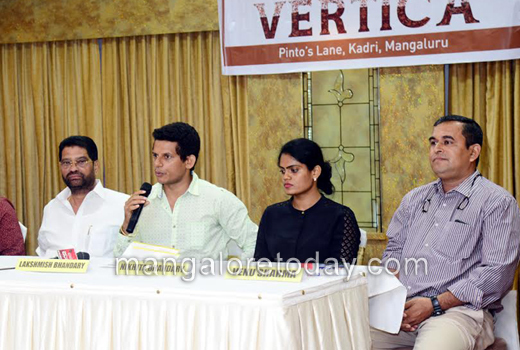 Mangaluru, Mar 17, 2017: ’’Bhandary Vertica’ -the tallest apartment project by Bhandary Builders will be launched on March 19 at Pinto’s Lane, Kadri, Mangaluru. Speaking to media, Lakshmish Bhandary, Managing Director of Bhandary Builders on Friday March 17, said that ’’Bhandary Vertica’ will be the first of its kind in Mangaluru. The project will be unique and ultra modern and incomparable in its features to any other premium residential project. Located at Pinto’s Lane, Kadri, a prime area in Mangaluru, ’Bhandary Vertica’ which will have 56 floors. It will be launched in the presence of a host of dignitaries including Nalin Kumar Kateel, MP, JR Lobo, MLA, Dr Shantharam Shetty, Pro-Chancellor of Nitte University, T Gowtham Pai, Managing Director of Manipal Group, A J Shetty, Chairman of AJ Group, K Jayavarmaraj Ballal, M N Rajendra Kumar, SCDCC Bank Chairman, M Mohan Alva, Chairman of Alva’s Educational Foundation, Shashidhar Hegde, former mayor and D K Ashok, Corporator. The project launch will be followed by a mega entertainment event featuring Sunil Grover of Dr Mashoor Gulati fame in the popular Kapil Sharma Show. There will also be a musical event featuring eminent playback singers including Hemanth, Supriya Lohith and Ajay Warrier. The above information was provided by Lakshmish Bhandary, Managing Director of Bhandary Builders at a press meet held on March 17, Friday. Bhandari Vertica will feature for the first time in the city a residential gateway with a video door phone, digital lock for main door, intelligent fire detection and suppression system, automatic entrance gate, digital lock with biometrics, digital entrance lobby, 360 degree CCTV coverage, intelligent access with visitor management, intrusion alarm, Bhandary Vertica resident app, GPS tracker, geo fencing alarm, presence based control, emergency switch in lift, infotainment and emergency panel. The project will also have a valet parking for the first time. The 56 floor project will have only one flat on the floors from 5th to 34th floor while there will be duplex flats from the 35th till the 56th floor. Bhandary Vertica also features a climate controlled ozone swimming pool on third floor, centralised AC, RFID Lift, Roof top party hall, sensor light at common areas and car park, sky garden, observation deck, LED strip light, piped music system, back-up UPS among other facilities. Nikhita L Bhandary, Director of Bhandary Builders, Venu Sharma, CEO of Bhandary Builders, M N Rajendra Kumar, Chairman of SCDCC Bank and Gokul Raj, architect of the project, were present. Director of Bhandary Builders Nikhita L Bhandary, president of SCDCC Bank M N Rajendra Kumar, CEO of Bhandary Builders Venu Sharma and architect of ’Bhandary Vertica’ Gokul Raj were present. Founded in 1999, Bhandary Builders is a versatile property group with activities covering property development and construction that has promoted and developed 11 multi-storied projects comprising housing, commercial spaces and villas, and is involved in completing two ongoing projects, all in Mangaluru over the past decade.